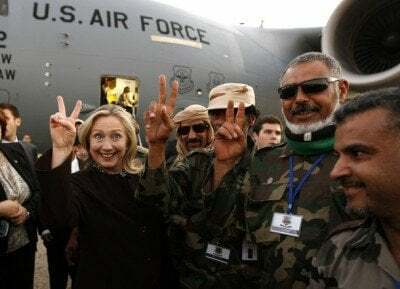 Image: Hillary Clinton with the so-called pro-democracy rebels in Libya during the NATO intervention which overthrew Gaddafi. An anonymous source told Fox News on Tuesday the U.S. government believes a terror attack comparable to the 9/11 attack will arise from Libya. Citing the presence of Islamic State operatives in Benghazi, Derna and Sirte, the government argues it needs authority to go into Libya in pursuit of terrorists. In late February the Director of National Intelligence, James R. Clapper, said during a Senate Armed Services Committee hearing Libya is the most “troublesome” country in the Middle East. State Department spokeswoman Marie Harf told reporters Libya must deal with its security issues with the help of the United States and the United Nations. The United Nations and the U.S., however, have tied the hands of Khalifa Haftar, a general supported by the West in the ongoing battle against Libya Dawn, a coalition of Islamic militias that has taken over Tripoli and large part of western Libya. The United Nations has called for the creation of a maritime monitoring force to prevent weapons from entering and illegally exported oil from leaving the north African country. According to UNSC resolution 2174, weapons may only be imported into Libya with the permission of “recognized authorities” and the transfers have received approval from the Sanctions Committee which must be notified of any transactions in advance. The U.S., the United Nations and Britain want a handpicked government installed before the current arms embargo is lifted. The recent State Department remarks on Libya ignore the fact the United States is directly responsible for arming Libyan militants, including al-Qaeda. “The White House and senior Congressional members deliberately and knowingly pursued a policy that provided material support to terrorist organizations in order to topple a ruler Muammar Gadhafi ,” the Citizens Commission on Benghazi said in an interim report released last April. “The United States switched sides in the war on terror with what we did in Libya, knowingly facilitating the provision of weapons to known Al-Qaeda militias and figures,” said Clare Lopez, a former CIA officer and a member of a commission established by Accuracy in Media to study the Benghazi arms transfer.